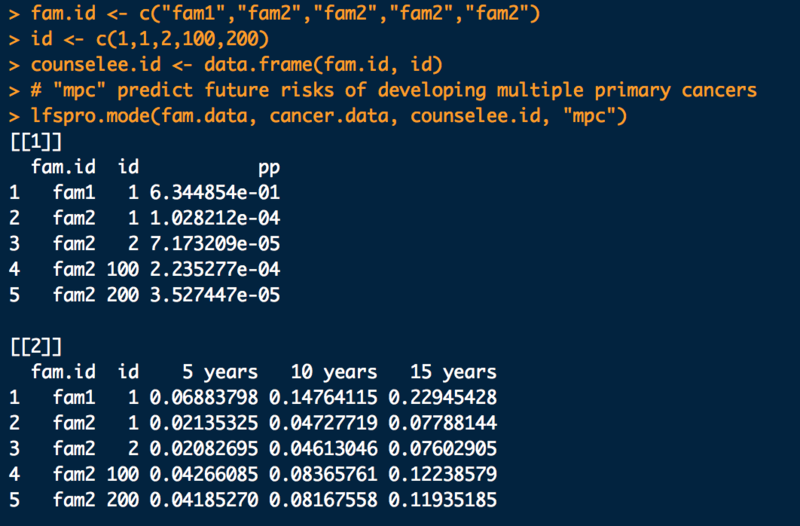 Last updated New features in 2.0.0: lfspro.mode is added to replace lfspro to account for additional utilities in cancer-specific and multiple primary cancer risk predictions. Simply specify parameter ‘mode’ to call desired functions. TP53 germline mutations are the main cause of Li-Fraumeni Syndrome . This package is designed to estimate probabilities that: 1) the counselee is a TP53 germline mutation carrier, 2) the counselee develops any cancer in future, 3) the counselee develops breast cancer, sarcoma or any other cancers in future, 4) the counselee develops a first or second primary cancer in future, on the basis of his/her family cancer history. The package also provides functions for using the LFS classic1 and Chompret criteria2,3. Note: Please let us know if you encounter any problems or issues in installing or downloading packages. The details about how to install R and LFSPRO package, please check the Documentation below. LFSPRO requires two data sets as input. 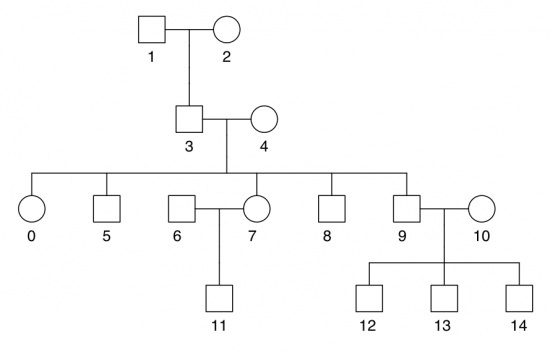 One data set stores the pedigree information and the other stores the cancer information. fid: father’s id. If the individual is the founder of the pedigree, set his/her father’s id as NA. mid: mother’s id. If the individual is the founder of the pedigree, set his/her mother’s id as NA. age: if the individual is alive, it is his/her current age. Otherwise, it is age of death. cancer.type: We classified the cancers into 11 groups as below according to NCCN Guidelines Version 1.2012 Li-Fraumeni Syndrome criteria. diag.age: The age when the individual was diagnosed with the cancer. The following code briefly illustrates how to used the package. Check the manual for details. LFSPRO will output the TP53 mutation carrier probability and/or future cancer risk for each counselee. 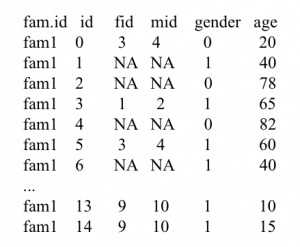 When mode is “1st.all”, it ouputs the TP53 mutation carrier probability for each counselee. 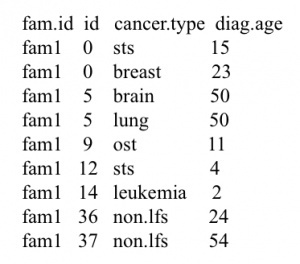 It is a data frame with 3 variables: fam.id (family id), id (individual id) and pp (posterior probability that the counselee is a TP53 mutation carrier). 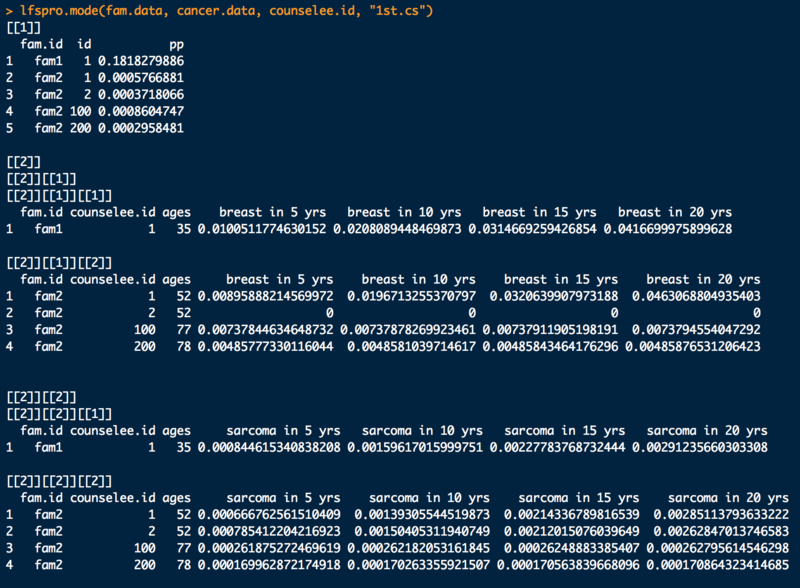 When mode is “1st.cs”, it outputs a list, contains a data frame of TP53 mutation carrier probability and a list of future risks of having breast cancer, sarcoma, other cancers and death for each counselee. When mode is “mpc”, it outputs a data frame of TP53 mutation carrier probability and a data frame of future cancer risk prediction of developing multiple primary cancer for each counselee. Here you can download the standard R documentation for LFSPRO.